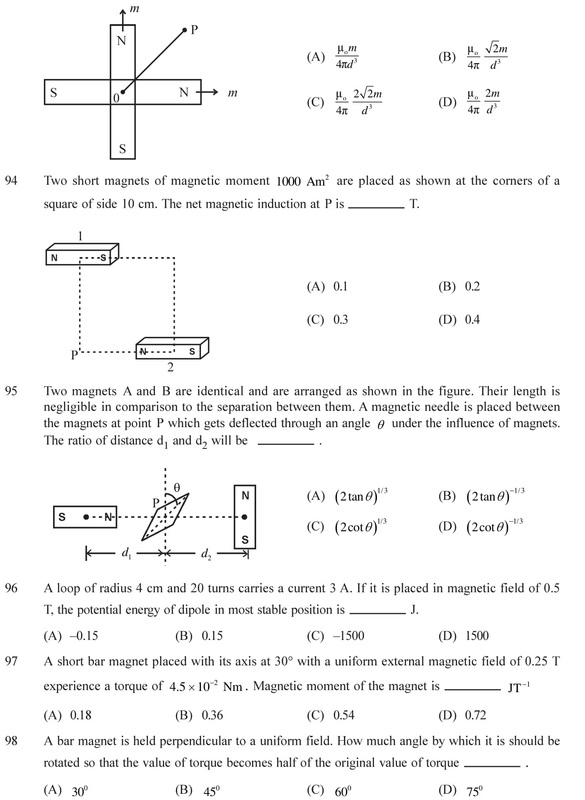 NCERT Solutions for Class 12 Physics Chapter 5 Magnetism and Matter in PDF form. All the NCERT Solutions are based on new NCERT Books. Download solutions in English Medium and there are questions given for the preparation of competitive exams like NEET, JEE – Mains and Advance, AIIMS and other exams. 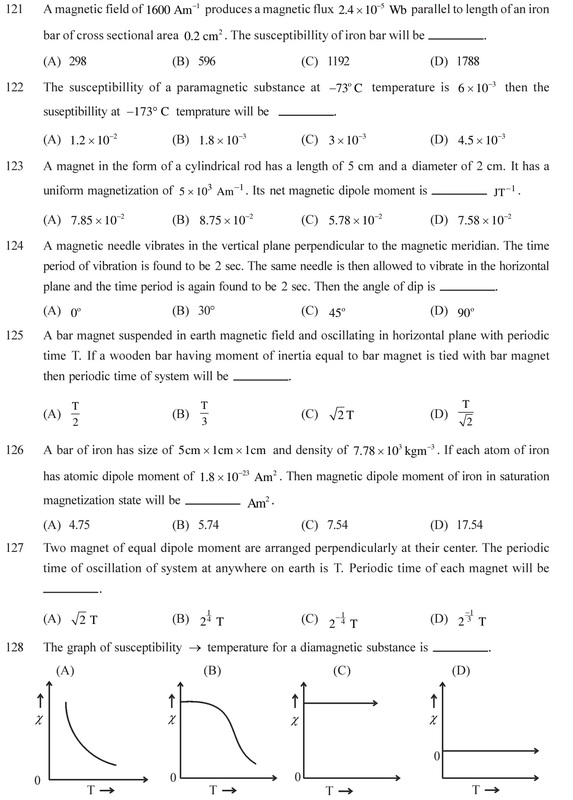 Download NCERT Solutions for Class 12 Physics Chapter 5 Magnetism and Matter in PDF form with the links given below. 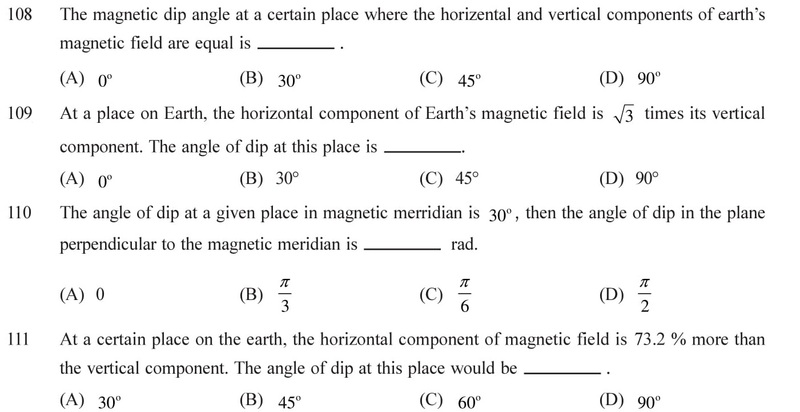 Following are the questions for competitive exams for practice. Answers of each questions is given below. Select the topic and practice for the tests. 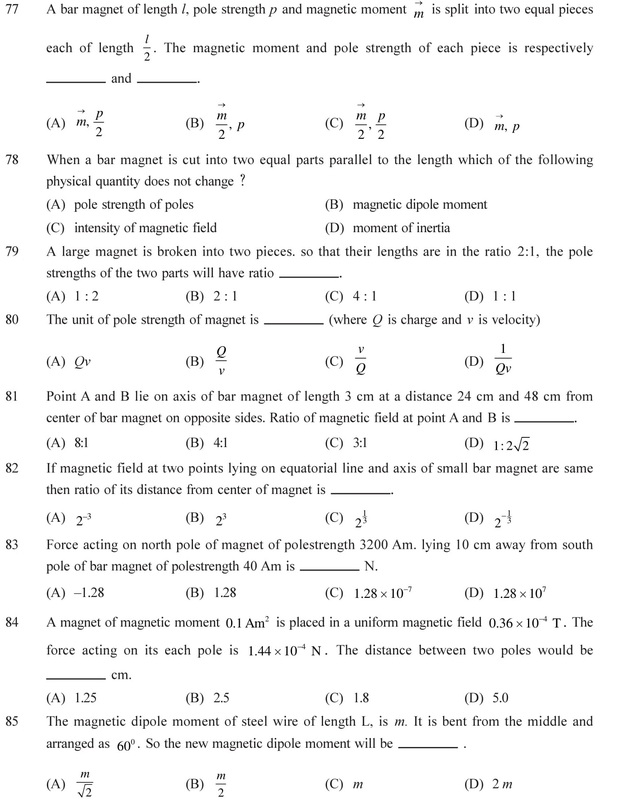 For the questions 1 to 76 which are based on moving charges, Click here. 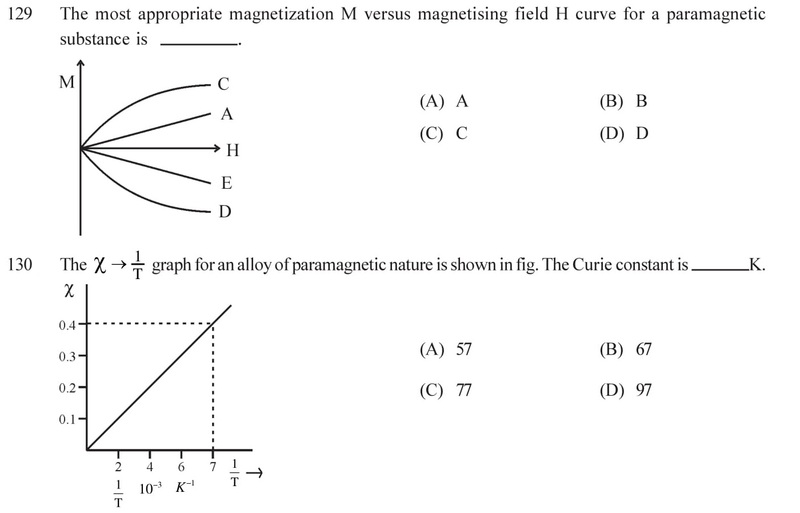 Magnetic dipole as a current carrying loop, as a bar magnet, pole strength, Magnetic force of attraction or repulsion between two poles, Torque, potential Energy and work done on a Magnetic dipole. See Answers. 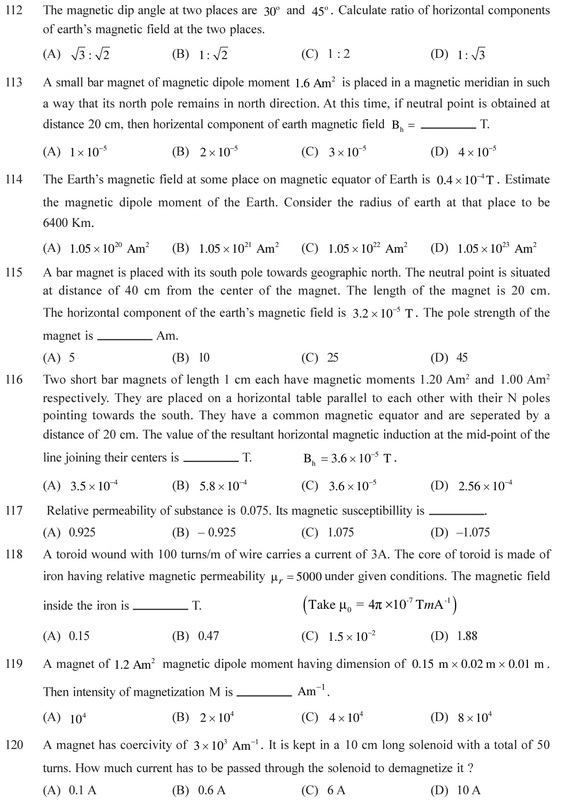 Magnetic susceptibility, permeability, Curie’s law and Curie’s temperature, the factors affecting the Earth’s Magnetism – Horizontal component, Vertical component and Angle of Dip, etc. See Answers. All the questions are solved properly and them answer is calculated. If still there is any error, please inform us so that we can make correction. 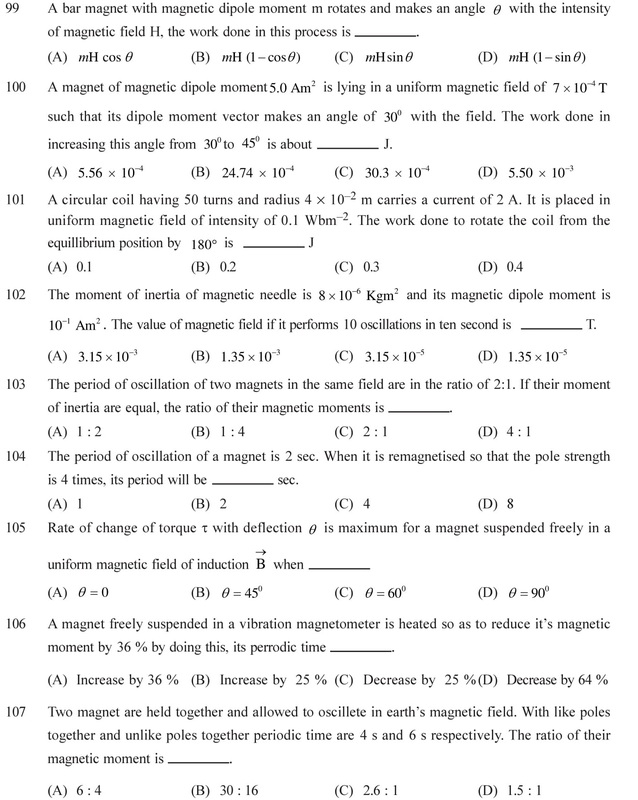 The questions given above are mostly based on Magnetism and Matter, properties of magnet (permanent and electromagnet) and the methods which increase the magnetism of a magnet. 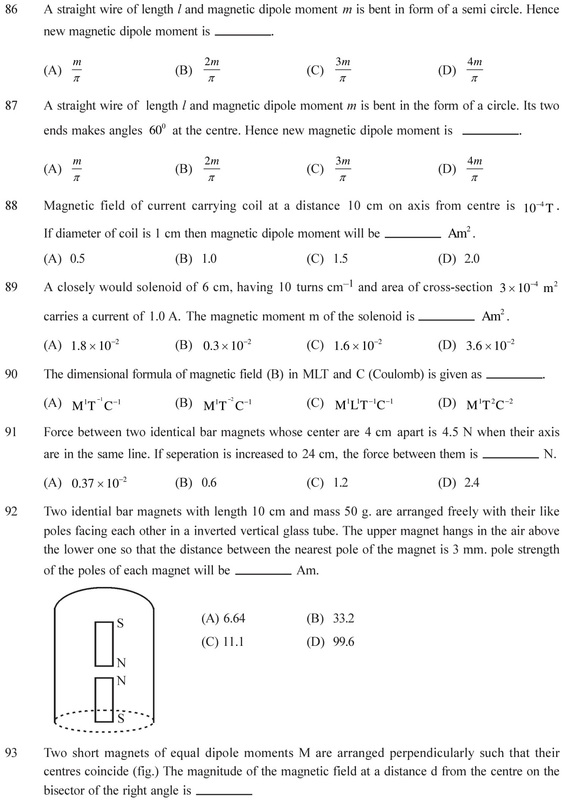 Questions based on Moving Charges and Magnet are also available, to see this Click here. 77 (B), 78 (C), 79 (D), 80 (A), 81 (A), 82 (D), 83 (B), 84 (B), 85 (B), 86 (B), 87 (C), 88 (A), 89 (A), 90 (A), 91 (A), 92 (A), 93 (C), 94 (A), 95 (C), 96 (A), 97 (B), 98 (C), 99 (B), 100 (A), 101 (A), 102 (A), 103 (B), 104 (A), 105 (A), 106 (B), 107 (C), Ans. :108 (C), 109 (D), 110 (D), 111 (A), 112 (A), 113 (B), 114 (D), 115 (D), 116 (D), 117 (B), 118 (D), 119 (C), 120 (B), 121 (B), 122 (A), 123 (A), 124 (C), 125 (C), 126 (C), 127 (C), 128 (D), 129 (A), 130 (A).